Kaitlin Pomerantz’s On the Threshold (Salvaged Stoops, Philadelphia) was a monument to a beloved symbol of Philadelphia neighborhood culture: the stoop, or step(s), as it is known in South Philadelphia. As Pomerantz noted, the stoop is “a threshold between private and public space . . . [it] functions as a site of social interaction, of relaxation, and of participation.” Responding to extensive renovations and redevelopment currently taking place across the city, Pomerantz intercepted historic building materials from demolition sites that would otherwise end up in the waste stream. In the six months leading up to the exhibition, she collected marble, concrete, and brick. She then worked with members of the Bricklayers and Allied Craftworkers Local 1 PA-DE to reconstruct the materials using traditional masonry techniques, and lined a pedestrian walkway on the eastern side of Washington Square Park. The park’s history as a public gathering place and an unmarked cemetery had sparked the idea for the project, which stimulated conversation about architectural and individual memory. Pomerantz initially proposed a version of On the Threshold (Salvaged Stoops, Philadelphia) as a speculative monument during Monument Lab’s discovery phase in 2015, supported by the Pew Center for Arts and Heritage. Partners: Mural Arts Philadelphia, The Pew Center for Arts & Heritage, Independence National Historical Park, Bricklayers and Allied Craftsworkers Local 1 PA-DE, International Masonry Institute, and Williamson College of the Trades. On the Threshold (Salvaged Stoops, Philadelphia) was presented as a part of the Monument Lab: Philadelphia (2017) exhibition. Awards: On the Threshold (Salvaged Stoops, Philadelphia) was recognized by the Americans for the Arts’ Public Art Network Year in Review as one of the top 50 outstanding public art projects from across the country in 2017. Kaitlin Pomerantz was recognized with a 2018 Young Friends of the Preservation Alliance Award for her Monument Lab installation. On the Threshold (Salvaged Stoops, Philadelphia) is a monument to Philadelphia’s distinct neighborhood cultures and varied historic and vernacular architectures, as told through the iconic architectural element of entryway steps, or the stoop. A feature originally associated with Dutch architecture (the Dutch stoep meaning "step"), stoops are prominent on Philadelphia buildings ranging from common row houses to more elite homes. A threshold between private and public space, the stoop functions as a space of social interaction, of relaxation, and of participation. As urban theorist Jane Jacobs described, the stoop is part of an "eyes on the street" community practice, a way for residents to participate, watch, and take care of social spaces. This monument consists of a dozen stoops that have been salvaged from recently demolished buildings around the city of Philadelphia, and reconstructed using historical and traditional masonry techniques by Bricklayers and Allied Craftsworkers Local 1 PA-DE. These fragments-become-whole-again invite viewers to consider the vast changes taking place in the landscape of Philadelphia—the city's architectural and social histories, and what is being lost as well as preserved in a time of rampant development. They remind us of how built space shapes social space, and ask us to be active citizens in matters pertaining to the landscape of Philadelphia as it passes into this new threshold of economic growth. 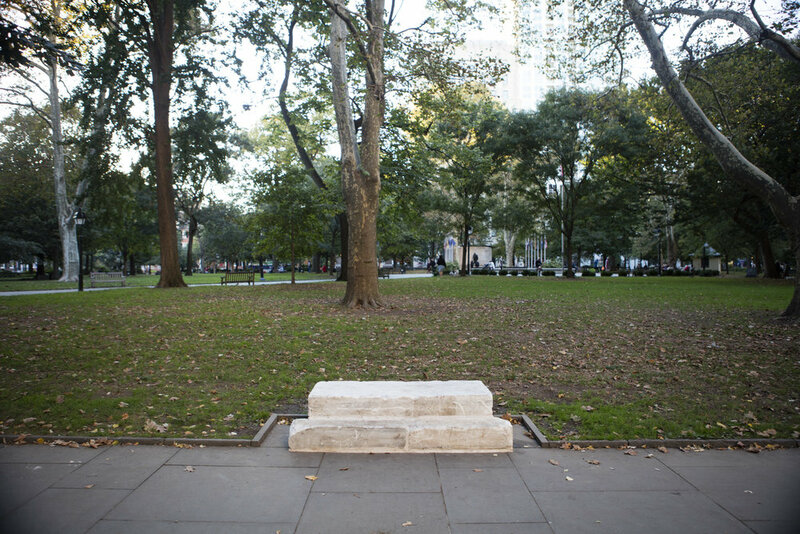 As relics of bygone buildings, the stoops also invite viewers to contemplate the history of Washington Square Park as a site of lives lost and histories buried, as the park once functioned as a common burial ground—or potter’s field—for many years before becoming a public park. These unmarked pieces of material history recall the unmarked lives and stories buried below the soil. 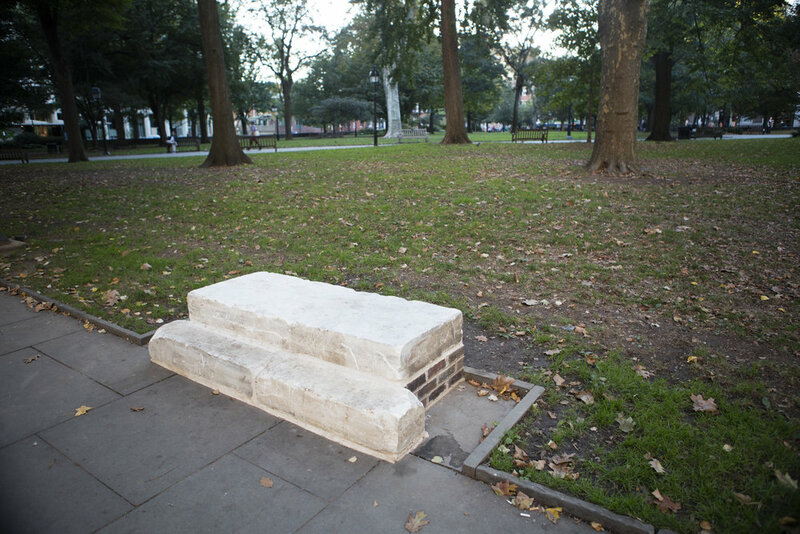 The stoops line Washington Square Park’s easternmost passage, inviting viewers to sit, pass by, engage, and remember. The project will feature a “stoop stories” audio and photo collection, which will be featured in a public archive and with news media partners. Finally, the living vernacular architecture of stoops can be explored in the artist’s Instagram project account, @stoop_phenomena_. Kaitlin Pomerantz is a visual artist and educator based in Philadelphia, PA. Her sculpture, intermedia installation, 2D works, and writing explore the relationship between humans and nature, landscape and land use, and themes of history, vacancy, loss, and renewal. Pomerantz participated in the academic arts residency program, Land Arts of the American West, based out of Texas Tech University, this past fall. Pomerantz is co-facilitator of recurring botanical arts project, WE THE WEEDS, which will attend the Cabin Time residency out of Los Angeles this spring. Pomerantz has most recently shown work at Little Berlin, Philadelphia; Texas Tech Museum, Lubbock, TX; and Fjord Gallery, Philadelphia. She holds a BA in Art History from University of Chicago, and an MFA in Interdisciplinary Visual Art from University of Pennsylvania. Pomerantz is Visiting Assistant Professor of Fine Arts at Haverford College.